Harness Wires consist of wiring harnesses mainly from automotive parts, free from heavy plastic and other attachments. The average recovery rate is 35% copper. 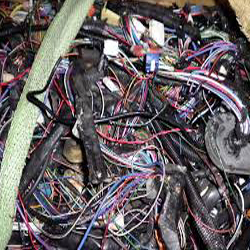 Harness wires have a scrap metal value due to their copper wiring. They can be sold as-is or stripped to bare copper for a higher value.